An optical fiber (or fibre) is a glass or plastic fiber that carries light along its length. Fiber optics is the overlap of applied science and engineering concerned with the design and application of optical fibers. Optical fibers are widely used in fiber-optic communications, which permits transmission over longer distances and at higher bandwidths (data rates) than other forms of communications. Fibers are used instead of metal wires because signals travel along them with less loss, and they are also immune to electromagnetic interference. Fibers are also used for illumination, and are wrapped in bundles so they can be used to carry images, thus allowing viewing in tight spaces. Specially designed fibers are used for a variety of other applications, including sensors and fiber lasers. are used for most communication links longer than 550 meters (1,800 ft). To measure the Numerical Aperture (NA) of the Given Optical Fibre. Numerical aperture accounts for the light gathering ability of the fibre and it amounts the light accepted by the fibre. NA refers to the maximum angle at which the light incident on the fibre end is totally internally reflected and is transmitted properly along the fibre. NA depends only on the refractive indices of the material of the core and the cladding. NA is also called the figure of merit of optical fibre. 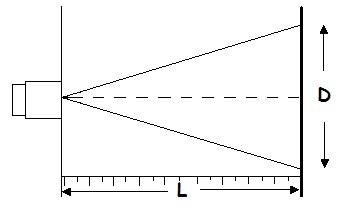 The cone formed by the rotation of angle of acceptance along the axis of the fibre is the cone of acceptance of the fibre. The light should strike the fibre end within its cone of acceptance else it is refracted out of the fibre. For short length of straight fibre, light ray incident at angle θ at the input end and must come out at same anglerom th output end. So, at the output end of the fibre also a cone of the same angle appears. Hence, NA can be determined by making measurements on the cone at the output end for fibre. 1. Connect the power to the board. 2. Connect one end of the fibre cable to the outut socket of the emitter and other end to the numerical aperture measurement jig. 3. Hold the white screen facing fibre such that its cut face is perpendicular to the axis of the fibre. Hold the white screen with two concentric circles (0.8cm & 1.6cm diameter) vertically to a suitable distance to make the red spot coincide with small circle. 4. 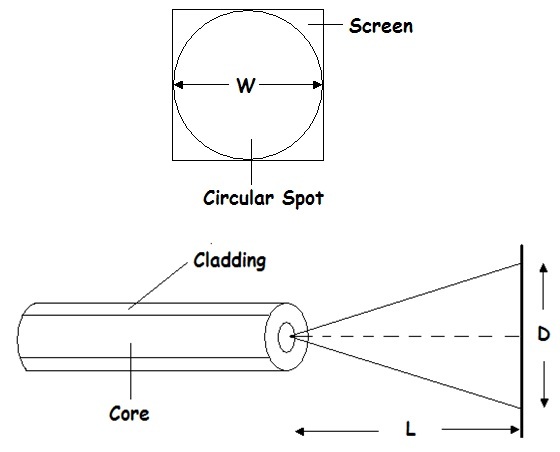 Record the distance of the screen from the fibre end and the diameter of the spot. 5. Compute NA from the formula given above. 6. Vary the distance between the screen and the fibre optic cable so that the sot coincides with the bigger circle. Note the distance of the screen from the fibre end. Optical fiber can be used as a medium for telecommunication and networking because it is flexible and can be bundled as cables. It is especially advantageous for long-distance communications, because light propagates through the fiber with little attenuation compared to electrical cables. This allows long distances to be spanned with few repeaters. Additionally, the per-channel light signals propagating in the fiber can be modulated at rates as high as 111 gigabits per second, although 10 or 40 Gb/s is typical in deployed systems. Each fiber can carry many independent channels, each using a different wavelength of light (wavelength-division multiplexing (WDM)). The net data rate (data rate without overhead bytes) per fiber is the per-channel data rate reduced by the FEC overhead, multiplied by the number of channels (usually up to eighty in commercial dense WDM systems as of 2008). The current laboratory fiber optic data rate record, held by Bell Labs in Villarceaux, France, is multiplexing 155 channels, each carrying 100 Gbps over a 7000 km fiber. For short distance applications, such as creating a network within an office building, fiber-optic cabling can be used to save space in cable ducts. This is because a single fiber can often carry much more data than many electrical cables, such as Cat-5 Ethernet cabling. Fiber is also immune to electrical interference; there is no cross-talk between signals in different cables and no pickup of environmental noise. Non-armored fiber cables do not conduct electricity, which makes fiber a good solution for protecting communications equipment located in high voltage environments such as power generation facilities, or metal communication structures prone to lightning strikes. They can also be used in environments where explosive fumes are present, without danger of ignition. Wiretapping is more difficult compared to electrical connections, and there are concentric dual core fibers that are said to be tap-proof. Although fibers can be made out of transparent plastic, glass, or a combination of the two, the fibers used in long-distance telecommunications applications are always glass, because of the lower optical attenuation. Both multi-mode and single-mode fibers are used in communications, with multi-mode fiber used mostly for short distances, up to 550 m (600 yards), and single-mode fiber used for longer distance links. Because of the tighter tolerances required to couple light into and between single-mode fibers (core diameter about 10 micrometers), single-mode transmitters, receivers, amplifiers and other components are generally more expensive than multi-mode components. Fibers have many uses in remote sensing. In some applications, the sensor is itself an optical fiber. In other cases, fiber is used to connect a non-fiberoptic sensor to a measurement system. Depending on the application, fiber may be used because of its small size, or the fact that no electrical power is needed at the remote location, or because many sensors can be multiplexed along the length of a fiber by using different wavelengths of light for each sensor, or by sensing the time delay as light passes along the fiber through each sensor. Time delay can be determined using a device such as an optical time-domain reflectometer. Optical fibers can be used as sensors to measure strain, temperature, pressure and other quantities by modifying a fiber so that the quantity to be measured modulates the intensity, phase, polarization, wavelength or transit time of light in the fiber. 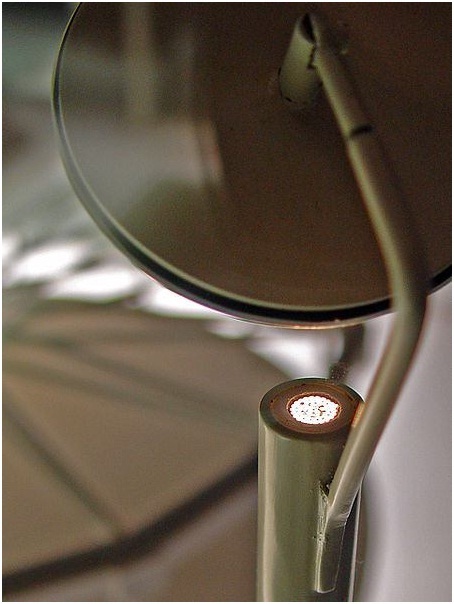 Sensors that vary the intensity of light are the simplest, since only a simple source and detector are required. A particularly useful feature of such fiber optic sensors is that they can, if required, provide distributed sensing over distances of up to one meter. Extrinsic fiber optic sensors use an optical fiber cable, normally a multi- mode one, to transmit modulated light from either a non-fiber optical sensor, or an electronic sensor connected to an optical transmitter. A major benefit of extrinsic sensors is their ability to reach places which are otherwise inaccessible. An example is the measurement of temperature inside aircraft jet engines by using a fiber to transmit radiation into a radiation pyrometer located outside the engine. Extrinsic sensors can also be used in the same way to measure the internal temperature of electrical transformers, where the extreme electromagnetic fields present make other measurement techniques impossible. Extrinsic sensors are used to measure vibration, rotation, displacement, velocity, acceleration, torque, and twisting. Fibers are widely used in illumination applications. They are used as light guides in medical and other applications where bright light needs to be shone on a target without a clear line-of-sight path. In some buildings, optical fibers are used to route sunlight from the roof to other parts of the building (see non-imaging optics). Optical fiber illumination is also used for decorative applications, including signs, art, and artificial Christmas trees. Swarovski boutiques use optical fibers to illuminate their crystal showcases from many different angles while only employing one light source. Optical fiber is an intrinsic part of the light-transmitting concrete building product, LiTraCon. Optical fiber is also used in imaging optics. A coherent bundle of fibers is used, sometimes along with lenses, for a long, thin imaging device called an endoscope, which is used to view objects through a small hole. Medical endoscopes are used for minimally invasive exploratory or surgical procedures (endoscopy). Industrial endoscopes (see fiberscope or borescope) are used for inspecting anything hard to reach, such as jet engine interiors. In spectroscopy, optical fiber bundles are used to transmit light from a spectrometer to a substance which cannot be placed inside the spectrometer itself, in order to analyze its composition. A spectrometer analyzes substances by bouncing light off of and through them. By using fibers, a spectrometer can be used to study objects that are too large to fit inside, or gasses, or reactions which occur in pressure vessels. An optical fiber doped with certain rare earth elements such as erbium can be used as the gain medium of a laser or optical amplifier. Rare-earth doped optical fibers can be used to provide signal amplification by splicing a short section of doped fiber into a regular (undoped) optical fiber line. The doped fiber is optically pumped with a second laser wavelength that is coupled into the line in addition to the signal wave. Both wavelengths of light are transmitted through the doped fiber, which transfers energy from the second pump wavelength to the signal wave. The process that causes the amplification is stimulated emission.